Loungerati recommends the following lovely weekend event that is a must attend for any vintage aficionado worth their straw boater. Michael Arenella, one of the hardest working bandleaders I know (I actually know many! 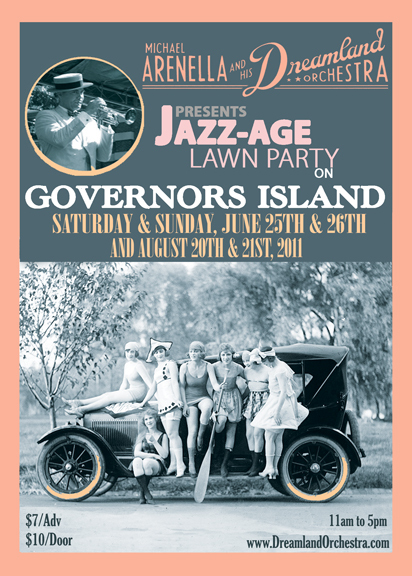 ), hosts the 6th Annual Jazz Age Lawn Party on New York's Governors Island. The party goes on for two days so really there are excuses short of a weekend wash out. See you there swells! Under a shady grove of centuries-old trees, caressed by fresh sea air, a sprawling green surrounded by historic officers' quarters and 18th century naval ramparts becomes the setting for a true Gatsby affair. A recession-friendly $7 advance admission gives you access to one of the Summer's most magnificent celebrations. *Featuring special guests Gelber & Manning! *Beautiful, real-wood '50 x '50 dance floor set up right on the lawn! *Gourmet entrees, sandwiches, salads and more will be for sale. Vegetarian dishes, too! *Tasty desserts, old-fashioned ice cream cones and ices! *Authentic '78 records from the 1920s played on antique phonographs by Michael Cumella of WFMU's Antique Phonograph Music Program. *1920s Motorcar Exhibition - take a spin around the island in a genuine rumble-seat; hold on to your hat! *Vintage clothing dealers and boutique milliners Ellen Christine Millinery, Fine and Dandy Shop, Noble Savage Vintage, Zelda Magazine, & More! - They will all be peddling wares, so be sure to tuck some cash in your garter. **If you'd like to sign up for the pie contest, you must pre-register by emailing Sarah Liston at govislandpie@gmail.com. Bakers can sign up until midnight Fri. June 24th. AND EVEN MORE ATTRACTIONS TO BE ANNOUNCED SOON! Celebrate summer a few days early! 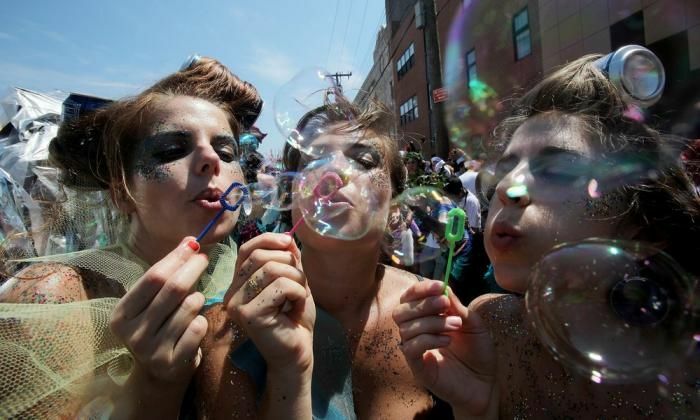 Get your fishtails out, your rubber crab claws, glittery pasties, and vintage cabanda wear, and celebrate Summer at the 28th Annual Coney Island Mermaid Parade! Each year, a different celebrity King Neptune and Queen Mermaid rule over the proceedings, riding in the Parade and assisting in the opening of the Ocean for the summer swimming season by marching down the Beach from the Boardwalk, cutting through Ribbons representing the seasons, and tossing fruit into the Atlantic to appease the Sea Gods. In the past, David Byrne, Queen Latifah, Ron Kuby, Curtis Sliwa, Moby, David Johansen and Harvey Keitel have graced our shores, presiding over the assembled masses. This year's King Neptune, Brooklyn native Adam Richman from the Travel Channel's Man V. Food and Queen Mermaid, Cat Greenleaf from the New York Emmy Award winning television show, Talk Stoop with Cat Greenleaf! The Parade is followed by the 9th Annual Mermaid Parade Ball at the New York Aquarium, a post-parade gathering where costumed parade participants can get together with each other and parade spectators to listen to live music, purchase raffle tickets, and watch burlesque and sideshow acts performed by some of New York City's hottest burlesque stars. Yehoodi "Brooklyn Bombshell" Mermaid party at Flatbush Farms in Park Slope. 5pm. That's at 76 Saint Marks Ave at Flatbush Avenue in Brooklyn. It isn't everyday you can see a band devoted to the exotica lounge music of Esquivel, Martin Denny, and Les Baxter. 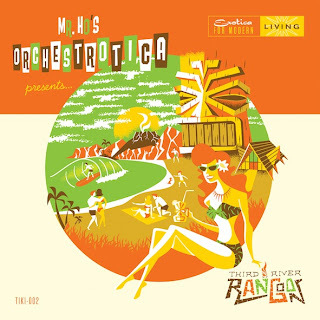 Brian O'Neill (aka Mr. Ho) leads a vibraphone infused orchestra that keeps true to the original exotica style. The party is also a record release for Third River Rangoon! The event is at the legendary Otto's Shrunken Head tiki bar. That means potent tropical cocktails to take the edge off the pre-summer heatwave. Not convinced yet? Mr. Ho ups the ante with the wild sounds of Primativa in Hi-Fi's DJs Jack Fetterman and Gina of the Jungle! So brush off the leopard print fez and head on over to Otto's. Otto's is tiny; don't wait for the door to get your tickets for our Third River Rangoon CD release party featuring exotica DJs Gina of the Jungle and Jack Fetterman. Not sure what you are in for? Lucid Culture recently posted a great review about the new album: Third River Rangoon. Doors open with DJ music at 830pm; live music starts at 9pm. Tickets: $15/adv, $20/door. CDs: Just $5 day of the show. LIMITED AVAILABILITY OF TICKETS - Otto's is quite small! (see below to buy tickets on this page). You must arrive by 9pm or your seat will not be guaranteed. Buy tickets from this page. 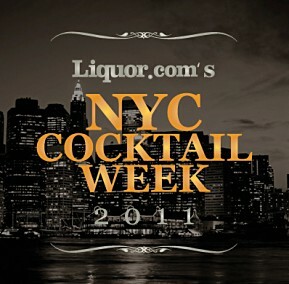 New York City Cocktail Week June 15th - 29th! A sure sign that cocktails are on the ascent in the culinary landscape is when there is an entire week devoted to showcasing libations. 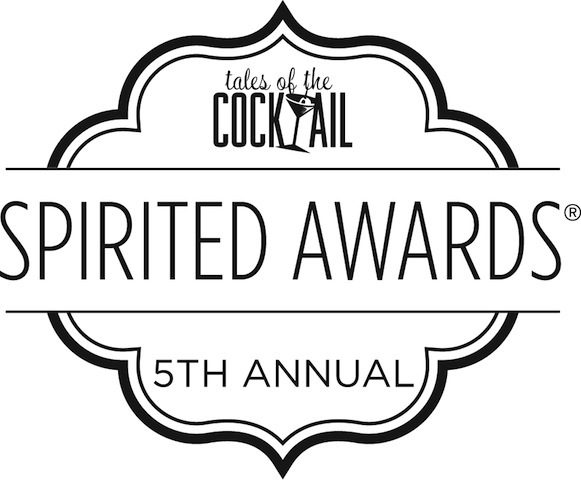 Spirits website Liquor.com has announced a partnership with some of New York City's premier cocktail bars and lounges in their first annual NYC Cocktail Week. For $20.11 the tippler receives two expertly crafted cocktails and an appetizer. Considering many of the establishments typically charge $12-15 for a cocktail, this is a great deal and more importantly, a terrific introduction to the cocktail bars. We suggest you hit a few bars in the same neighborhood and make a bar crawl of it! Oh, and this is for a good cause too!! This event also helps support two very worthy causes: City Harvest’s fight against hunger and The Museum of the American Cocktail’s efforts to preserve mixological history. Seriously, this is a top shelf selection of bars!! So get out there an have a deuce of drinks and an app for a good cause! Dates: 6/15/11 to 6/29/11 – Guests must be 21 or older. – Limit one offer per customer per visit. – Offer subject to availability. Loungerati does not need lessons in the pronunciation of Scotch whisky - we have a Scotsman on staff who ensures that education. 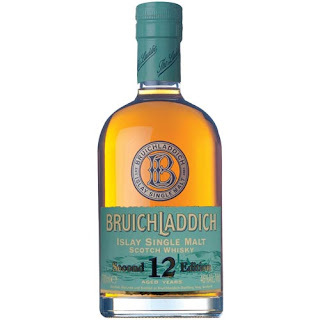 Nevertheless, we would like to share a list of prominent Single Malt Scotch whisky brands and their correct pronunciation which Esquire magazine was kind enough to publish. Slainté! *Edited thanks to Mal Spence, head bartender of the Salon at the Blythswood Hotel Bar in Glasgow who provided the correct pronunciation. Esquire, have your fact checker call Mal in the future! We have added our Votes (*) and predictions (W - Winners). 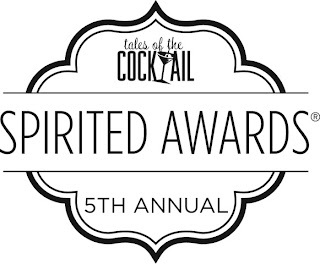 A wrap up of the awards after TOTC.